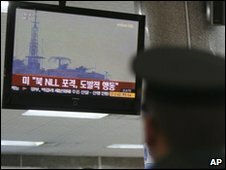 North Korea has fired artillery near its disputed maritime border with South Korea, a day after the two exchanged shots in the same area, reports say. The North fired several rounds of artillery toward the border early on Thursday, Yonhap news agency reported. According to an unnamed official quoted by the Associated Press, the shells landed in North Korean waters. The South had not responded, the official said. On Wednesday, it called the North's firing "provocative". But the North said the firing had been part of an annual military drill which would continue. The second incident in as many days comes after the North designated two no-sail zones in the area, including some South Korean waters, until 29 March. On Wednesday, the North's initial artillery rounds landed north of the sea border, while Seoul's forces fired at the rounds while they were in the air, the AFP news agency reports. The BBC's John Sudworth, in Seoul, says the incidents are being seen as a crude piece of military diplomacy rather than a direct threat, another example of the North's strategy of escalating tension to strengthen its negotiating hand. The western sea border is a constant source of military tension between the two Koreas. There have been three deadly exchanges between the two Koreas along the sea border in the past decade. In the most recent incident, last November, their navies fought a brief gun battle that left one North Korean sailor dead and three others wounded. South Korea recognises the Northern Limit Line, drawn unilaterally to by the US-led United Nations Command to demarcate the seas border at the end of the 1950-53 Korean War. The line has never been accepted by North Korea. Relations between the two Koreas have fluctuated in recent months. Talks about their jointly-run Kaesong industrial estate closed without agreement on 21 January. The attempt at dialogue took place amid fresh tensions apparently provoked by a South Korean think tank's analysis of a likely military coup or mass uprising in the North when the North's leader Kim Jong-il dies. However, North Korea did recently accept a small amount of aid from South Korea. The US, China, Russia, Japan and South Korea speak regularly of their hopes that North Korea will rejoin international talks about ending its nuclear programme.